Ever dreamed of scoring the winning goal for Scotland? It’s something any player would love to put on his sporting CV. And one man, Angus McKinnon, has the unique claim to be the first ever to achieve the feat. He managed it in March 1874, when England were beaten 2-1. After the first two Scotland-England contests had finished in a draw and a defeat, a record crowd estimated at 7,000 was attracted to the West of Scotland Cricket Ground. We know from SFA accounts that spectators paid a shilling for a ticket, and that match cards were sold for a penny. The pitch ran on a gentle slope north-south with spectators lined up behind the ropes. Scotland captain JJ Thomson kicked off at 3.30 prompt, setting in motion a fascinating clash of styles as the English were markedly bigger and stronger, while the Scots made up for that with their clever passing game. England took the lead midway through the first half when Robert Kingsford chested the ball over the line. Under the rules of the day, ends were changed and it was Scotland’s turn to have the advantage of playing downhill. The game was turned on its head shortly before half time: in the 40th minute Fred Anderson equalised, then three minutes later Angus McKinnon sent in a shot which slipped through the hands of English goalkeeper Welch. With no more scoring in the second half, this turned out to be the winning goal. Scotland had a victory to cherish. For McKinnon, it was just the start of a remarkable month of ‘firsts’. The following Saturday he travelled south with the first Glasgow select team to Sheffield, and the week after that he took part in the inaugural Scottish Cup final, which Queen’s Park won by defeating Clydesdale. Sadly, his goal-scoring ability did not earn him any more caps and this was his only appearance for the national team, although he did win two more Scottish Cup winner’s medals. He then suffered a serious illness which kept him out for a year, and despite making a comeback for Queen’s Park and also serving as club secretary for a few months, in 1878 he decided to emigrate. Tracking down what happened to Angus McKinnon, and indeed where he originally came from, was not easy. According to DD Bone’sScottish Football Reminiscences, published in 1890, McKinnon had died ‘about four years ago’ in Canada. However, extensive searches failed to come up with any possible matches and it was only when browsing through the Scottish Athletic Journal from 1884 that I found a comment that McKinnon ‘lies beneath the cold sod in Canada’. This inferred his death had taken place much earlier and eventually I found a manuscript register of his death in Kingston, Ontario in July 1880. This led me to an obituary notice the following month in the Glasgow Herald, placed by his mother; that in turn gave me a home address and I could start tracking him back. From Glasgow directories I found he had worked for West Watson & Son, merchants, but he was still invisible in the census returns. It was only by searching for his mother that I got the full story: it turned out Angus’s father, Neil McKinnon, had died when he was an infant, his mother had remarried, and Angus appeared in the census under his step-father’s surname, Taylor. He was 29 when he died which indicates he was born in 1851, but as this was before registration became compulsory there is no precise record. 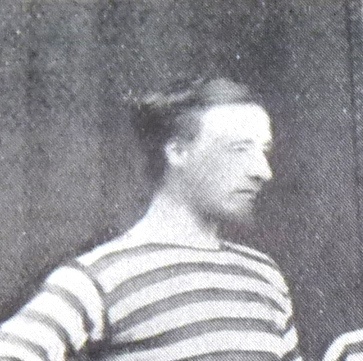 Scotland’s other goalscorer in 1874, Fred Anderson, also had an unusual life. He was born in 1855 into a wealthy family – his father was a cotton merchant – and attended Glasgow Academy as a boy. When he was 12 his father moved to Cheshire and Fred spent a few years in Wilmslow but returned to Glasgow in the 1870s, playing football for Clydesdale. He won his sole cap for Scotland aged just 18 years and 111 days, making him one of our youngest ever internationalists. Like McKinnon he was selected for Glasgow to face Sheffield, and was then on the losing side in the first Scottish Cup final, but that summer he returned south to embark on a business career which took him all the way to China. He became chairman of Shanghai Municipal Council and was a director of rubber exporting companies in Malaysia. On retirement he donated a library to the School of Oriental and African Studies in London, and died in 1940 at Hungerford, leaving a fortune worth £261,000. Scotland: Robert Gardner (Clydesdale), John Hunter (Third Lanark) and Joseph Taylor (Queen’s Park); Charles Campbell (Queen’s Park) and James J Thomson (Queen’s Park, capt); James Weir (Queen’s Park), John Ferguson (Vale of Leven), Harry McNeil (Queen’s Park), William Mackinnon (Queen’s Park), Angus McKinnon (Queen’s Park), Fred Anderson (Clydesdale). England: R de Courtenay Welch (Harrow Chequers), Robert Ogilvie (Clapham Rovers), Alfred Stratford (Wanderers), Francis Birley (Oxford University), Cuthbert Ottaway (Oxford University, capt), Charles Wollaston (Wanderers), Robert Kingsford (Wanderers), J Hawley Edwards (Wanderers), John Owen (Sheffield), Charles Chenery (Crystal Palace), Hubert Heron (Wanderers). Referee: Archibald Rae (Scotland). Umpires: William Keay (Scotland) and Alexander Morten (England). This article originally appeared as a blog post published on 23 March 2015.